This item is in like-new condition and works very well. Translate - one touch translate to spanish. Dictionary - definitions of words. Reading PEN 2 - Personal reading Assistant. Item type: Reading PEN 2 by WizcomTech. Like New - I opened the box and used it once maybe for less than 1 hour I put it on a shelf and forgot about it. Wizcom ReadingPen TS Portable Reading Tutor (WRPTS). Shipped with USPS Priority Mail. Lightly used. The pic shows the unit is working. Condition is Used. This pen has only been used twice. The case got broken, but the pen is like new and works very well. - pen (and case)- outer box- user manualFeaturesDisplays up to five lines of text on a high resolution touch-screen. This dictionary is in an excellent condition and works great! 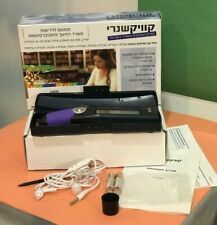 One(1) USED Quicktionary V1 English to Hebrew Handheld Scanner Electronic Dictionary with original storage case. This device only converts English to Hebrew ONLY! Quicktionary Wizcom PN Handheld Scanner Old Version -1998, in a working condition. fair opportunity to solve whatever dispute may arise. Take the Quicktionary® anywhere you go. This small, portable, handheld device is designed to fit in your pocket. English to Italian. Italian to English. English to Italian - (Included for free). English to French. Quicktionary II by Wizcom. Everything in Near Mint condition. No Batteries included. WIZCOM READINGPEN K12 PERSONAL. READING ASSISTANT CLASSROOM SET. We do not reset passwords. SOLD AS IS NO EXTRA ACCESSORIES INCLUDED. PORTABLE SPANISH TRANSLATOR. For this reason, we are typically unable to honor cancellation requests. You will need a suitable adapter to use the item in your country. Quicktionary Reading Pen Wizcom Technologies Scan & Hear. WizcomTech Quicktionary II Reading Pen. THE ULITMATE PORTABLE READING TOOL. Quicktionary II Reading Pen Tool Dictionary Scan Hear For Parts Does Not Work. Condition is Used. The end lights up red but the display does not light up. This is for repair or parts only. Repeat - it does not work. Take the Quicktionary® anywhere you go. This small, portable, handheld device is designed to fit in your pocket. English to Hebrew. Hebrew to English. English to Hebrew - (Included for free). Hebrew to English - (Included for free). Take the Quicktionary® anywhere you go. This small, portable, handheld device is designed to fit in your pocket. English to French. French to English. French to German. German to French. French to Swedish. Take the Quicktionary® anywhere you go. This small, portable, handheld device is designed to fit in your pocket. English to Arabic. English to Arabic - (Included for free). English to Russian. English to French. Trending at $202.50eBay determines this price through a machine learned model of the product's sale prices within the last 90 days. Take the Quicktionary® anywhere you go. This small, portable, handheld device is designed to fit in your pocket. English to Chinese Simplified. English to Chinese Traditional. Chinese Simplified to English. Take the Quicktionary® anywhere you go. This small, portable, handheld device is designed to fit in your pocket. Also provides audio pronunciation of individual words or full lines of text in selected languages. Take the Quicktionary® anywhere you go. This small, portable, handheld device is designed to fit in your pocket. English to Polish. Polish to English. English to Polish - (Included for free). Polish to English - (Included for free).